Chronic Pain can be extremely debilitating affecting not only the individual, but also their families and friends. At Generations Sport & Spine we take great pride in helping individuals restore their ability to participate in previous levels of activities. We recognize at times the process can be frustrating and discouraging, that's why we commit ourselves to working one on one with each person to identify the source of the problem and developing a plan of care unique to each individual in how best to optimize their health recovery. 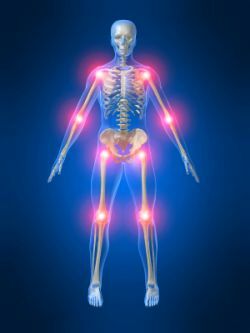 OA is an inflammatory condition, caused by a wearing away of the cartilage within the joint, resulting in bone-on-bone contact. Typical treatment includes addressing any biomechanical dysfunction that may cause excessive stress to an already overloaded joint, modalities for inflammation such as electrotherapy and laser, and hands-on techniques to allow for optimal soft tissue and joint mobility. RA is a systemic condition in which the body's immune system attacks the cartilage of the joints. As a result, you get bone on bone contact which then creates more bone formation and a change in joint shape. This process creates extreme amounts of pain with movement, greatly disrupting the quality of life for the individual. Physiotherapy treatment for this condition is based upon maintaining proper joint position and mobility. Thereby hands-on mobility techniques mixed with appropriate exercises are utilized. Furthermore, modalities such as electrotherapy, laser and acupuncture may be employed to decrease pain and inflammation. Education on proper movement patterning and motor learning strategies may be vastly important in the overall management of the condition, as such specific skills will be taught to the individual based upon their unique demands. Multiple Sclerosis (MS) is a condition that affects proper neural conduction within the central nervous system. It is an inflammatory condition that destroys the insulation or lining of the neurons, causing inefficient communication within the central nervous system, resulting in numerous secondary medical conditions and a wide range of movement issues. Most commonly, individuals complain of a lack of co-ordination, balance and strength within the extremities, typically starting in the legs. Furthermore, it is typical for individuals to develop spasticity and tightness throughout the extremities. Treatment involves developing strategies for improving/maintaining balance, co-ordination and strength. Exercises that focus on these physiological aspects will be employed along with guiding each individual through motor-learning techniques to maximize their outcomes. Furthermore, hands-on manual techniques may be used to help "break-up" spasticity and muscle tightness. Commonly people with MS complain secondary pain and orthopedic issues. As a result treatment may range from an array of hands-on methods and use of modalities to address orthopedic conditions and pain.